Any guidance you can give me is greatly appreciated! 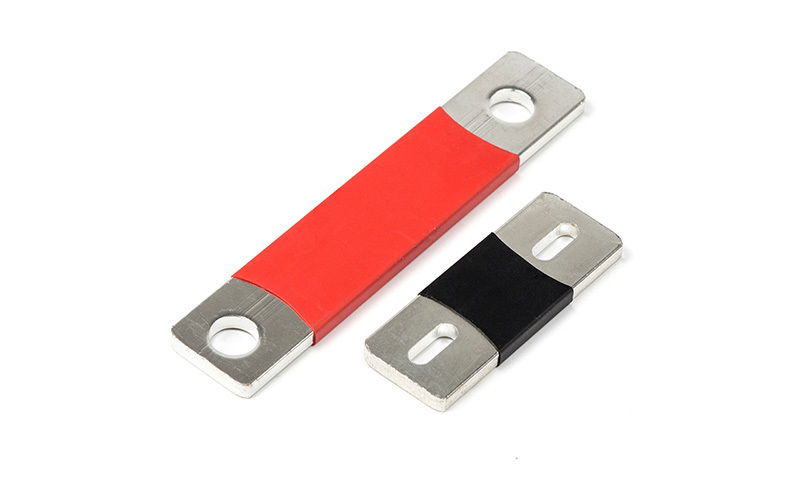 There is not enough vertical clearance above batteries to install MRBF fuses. There is almost no room in battery compartment to install a shunt and certainly no room to work without removing batteries. 2) Install BlueSea Safety Hub with 200 amp fuses for the three main circuits onto the access door. Additional small circuits for CO Detector and additional bilge pump. I’ve seen Distribution panels hinged but is it permissible to install main battery feeds onto a hinged access door? I know a fuse is not necessary for the engine starter but I would feel better with one. Is a 200 Amp fuse big enough for a 1.4 KW starter? If not, what type and size of fuse would you recommend. This is a question, not s solution cuz I don’t know the space. But could you install MRBFs upside down to eliminate the addl height issue? Sometimes that works but obvs depends on the specific box and batt posts. Fuse the starter cable for just under the capacity of the cable, not the starter amps. Avoids possible nuisance blows. 300 amp fuse fits on mine but very tight. I also have a negatve buss and echo charger inside the compartment under sink above water heater. I have a 1987 MK 1 with very similar set up to Noah's. I was able to mount 300A MRBF fuse and the smaller fuses for the Smartgauge, external regulator, shunt, and Echo Charger. See attached photo. The windlass breaker is mounted under the drop leaf for the counter. See attached photo. I installed the shunt for my Victron battery monitor outside of the battery compartment near the water tank on a board I bonded onto the hull and under the fiberglass seat support. My Digital Echo Charger is also installed there. See attached photo. I have a detailed write-up in the Tech WIKI with photo's, schematic, and parts list that may also help. FYI - The schematic does not show the windlass or additional 12V oulets I installed recently. There are separate write-ups with schematics for those also in the Tech WIKI. They're all listed in the Boat/Author section under Della Jean. One of the differences I see is that I have four separate battery boxes which take up space and elevate the batteries. How did you both deal with that? Is your compartment a sealed space? I have cable running through the bottom. I'm also trying to decide if I should go with AGM's and wondering if I could get away with two 12 V Firefly's? That would solve the battery box issue and both Lifelines and Firefly's are shorter which would allow MRBF's. My Trojans are about 7 years old but still seem pretty good. Any thoughts on decent AGM batteries? No need for separate battery boxes. i filled/leveled bottom tray with wood and I have one penetration through bottom for wire bundle that I ended up caulking around with silicone sealant (only sure bet sealant to resist any potential acid spill). 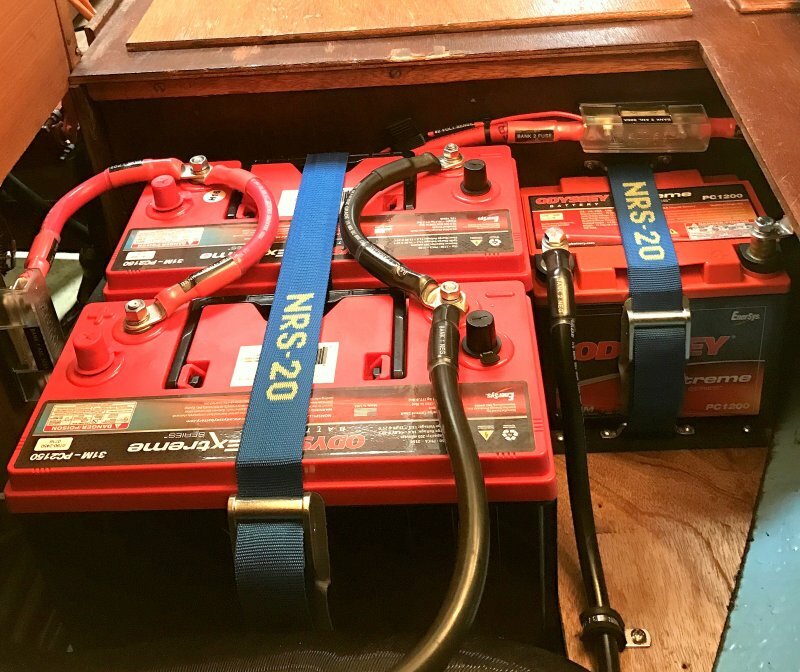 IMO, Flooded batteries will give you more trouble free bang for your buck, capacity, size, deep cycle abilitiy, in our boat’s particular configuration. 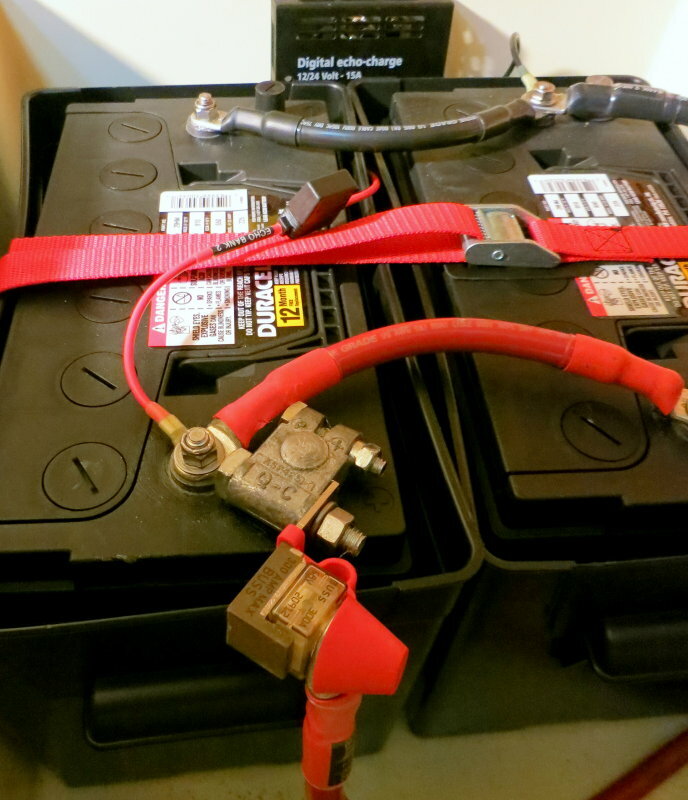 The battery boxes might be the reason, but you should investigate to be sure. The battery box for my reserve battery adds very little height. I sealed the only 2 holes in the bottom of the battery compartment. (I should go back and do a more proper job). I went with Trojan golf cart batteries because of good reputation, cost, availability, and provides 450ah house bank that fits. I also considered US Battery golf cart batteries which have a little more ah capacity. Aren’t the 12v firefly batteries ~110ah each? 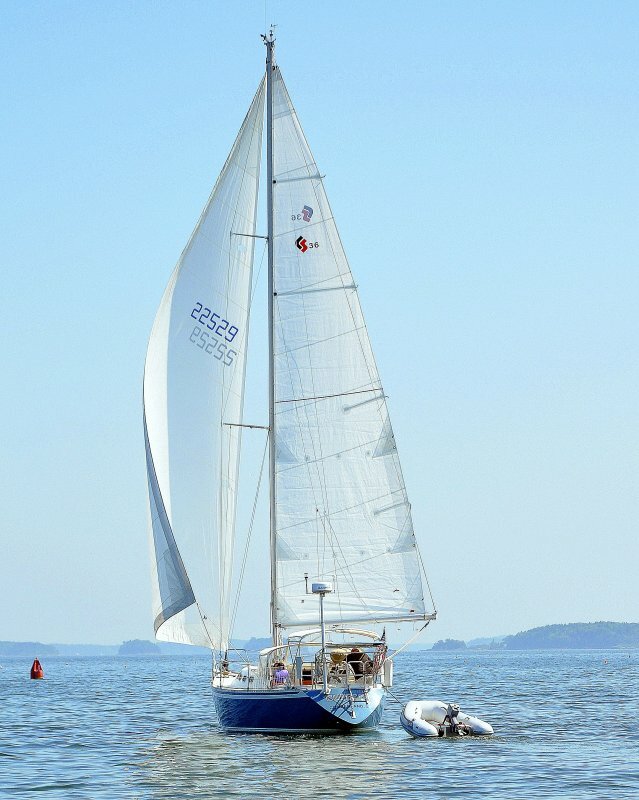 Will 220ah be enough for the amps you use per day for the type of sailing you do or plan on doing? Mainesail is the battery expert. As far as the hinged door idea, I think it is very suspect and subject to all sorts of problems. Moving big wires - what could go wrong? As Jon said, there are other places to put stuff outside the battery box, all it takes is a little longer wire, and since your's are so big anyway, voltage drop should not be an issue. There are options other than MRBF. You can consider Class T or ANL's. You'd be amazed where fuses will fit and quite often even meeting the 7" rule.. I agree with Stu on the hinged cover, the simpler the better. I would guess that with a hinged cover, you'd have to remove both the bottom and the back cushions so the cover can be fully opened. This presumes the cover would not hit the table on the way up. Then you'd need a way to keep it held open that doesn't poke you when you sit there. for what it's worth - I'd vote on staying with the original version of removing the bottom cushion and then the cover for access. Although the Firefly's are only 110ah, their useable amps are comparable. 4 T105's between 85% and 50% DOD =157 amps. 2 12V Firefly's with DOD from 85% down to 20% and fast absorption brings it to around 143 plus. They resist sulfation, tolerate PSOC and have longer lifecycles. Rod included them in a 2015 test for Practical Sailor http://www.practical-sailor.com/issues/37_53/features/Fighting-Sulfation-in-AGMs_11691-1.html. Bruce Schwab likes them https://www.bruceschwab.com/advanced-energy-storage-systems/firefly-energys-oasis-group-31/, Nigel Calder likes them. Note #2 & 3 of my goals. I really don't know how much power I use. I do have two items Rod says are important for AGM's - 110 Alternator with Serpentine belt conversions & smart charger as well as solar. Since the Firefly's seem to tolerate PSOC better than flooded and regular AGM's, they are interesting. If I can get away with two, they are only a couple hundred more than 4 T105's, will last longer and don't have the maintenance issues. Interesting, that is very helpful! At one point Rod had angle adapters (vert to horiz) adapters. Dunno if he still does. I couldn't find my pic of mounting the MRBF upside down as I described. But if the battery post is too far from the side of the case you can use a short flat buss bar to extend the fuse over the side of the battery case. Or in a pinch another MRBF fuse holder to extend it. About a hinged door - there's nothing preventing or "regulating" mounting electrical components on a door. There's thousands of C30s out there w/the battery selector switch on a hinged door above the Nav sta. But Stu's point that there's some potential for danger there is well-taken. So you have to do it right. Conductors **must** be tied down w/in 6" of a terminal post. Why? - on light-gauge, flexible wire, to prevent movement and wire flexure/strand failure at the terminal. But heavy, stiff cables can also transmit movement to the cable lug and tend to tighten or loosen the nut If the cable is secured, I don't see a problem -- you prevent that failure mode and you won't be opening the door daily (hopefully not at all. ) It sounds like you have this well thought out. I resist adding ANY UNNECESSARY potential failure points, but if, with all things considered, "whatever" is the best solution -- it just needs to be done correctly to minimize the failure mode. How many boats are out there with heavy (positive/negative) cables on the starter/bell housing and I'll bet a beer that they are not tied down to prevent movement, or how many unnecessary (JTSO) preheat solenoids/relays have been installed each adding multiple potential failure points?